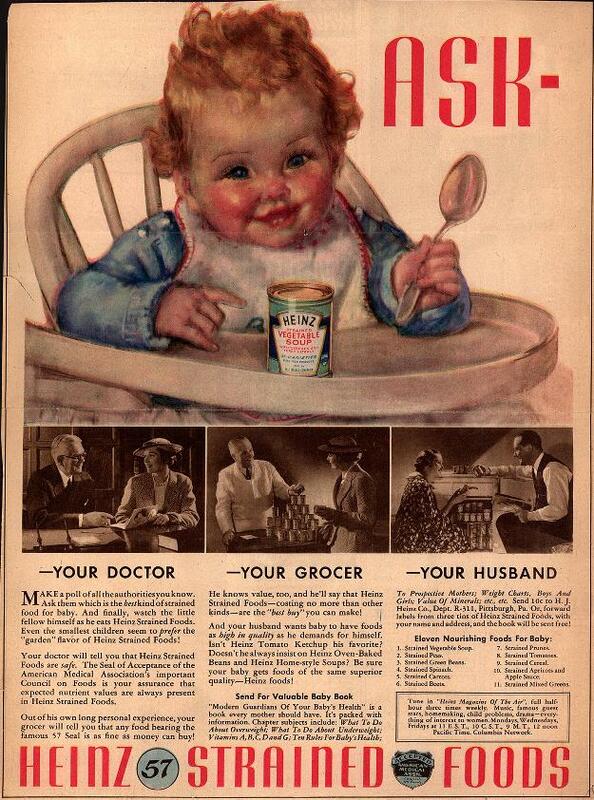 With the help of advertising agencies (conjure Mad Men here) and the “approval” and endorsement of the American Medical Association, pediatricians, doctors, and even the local grocer, parents soon came to believe that it was best to feed their babies canned (jarred now) foods. Mom couldn’t possibly prepare scientifically adequate and superior foods for her baby. And really, didn’t husbands need charming wives who were not tired from straining vegetables? 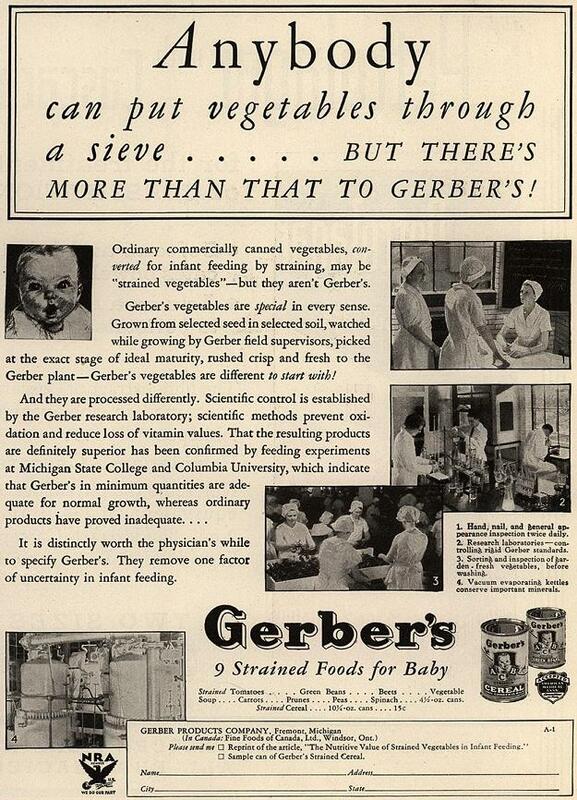 I have to say that Gerber was not the only business to target mothers in particular. Many companies were also using a variety of “emotional” ploys; Beechnut, Heinz and even Libby were hiring ad agencies and cranking out these types of ads too. In the year 2012, I still hear parents say “You mean I can make my baby’s food in my kitchen? It’s safe to do that? Will she/he get enough vitamins and minerals and other nutrients?” It has been 80+ years since baby food companies began their ads that I feel, have sadly undermined a Mother’s confidence in her ability to properly feed her baby. Advertising can have such a strong impact on our self-confidence (think fashion magazines) in all aspects of our lives. As our children grow, they too are subjected to ads touting “Magically Delicious” foods that really Mom, these foods are healthy because they have “whole grains” or “natural” ingredients. Remember my post about the Liquid Gold? It is so amazing to know that we (parents and websites/bloggers), are starting to turn this all around and reject the magically delicious for the real and fresh. 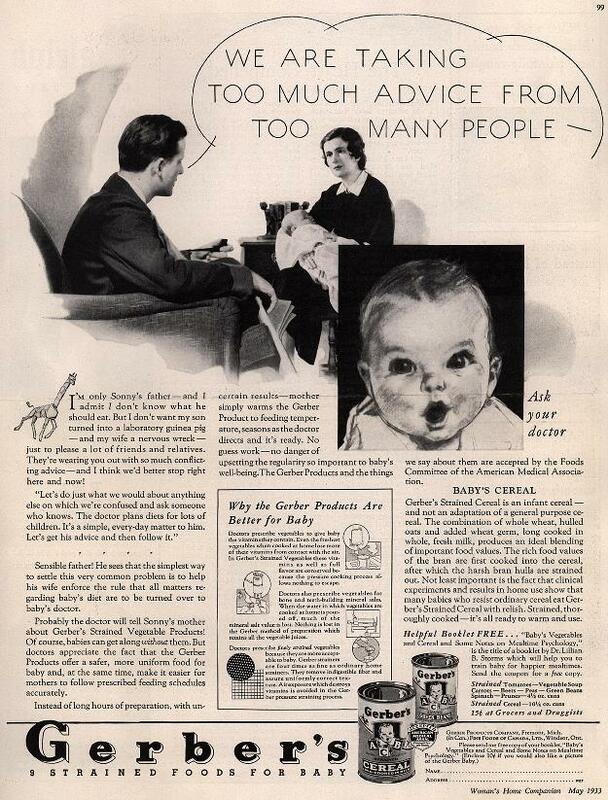 At the very least, baby food ads overtly stating that canned food is better have disappeared but the ads telling us we just don’t have time to cook baby’s foods are still around. One iconic baby food company has actually begun to label its line “purees”; I see that as a sign that homemade baby food making is stronger than ever!